With thanks to John Benson for his account of this trek across the remote, dramatic Cordillera Apolobamba and down into the Amazon basin, in support of the Multiple Sclerosis Trust. 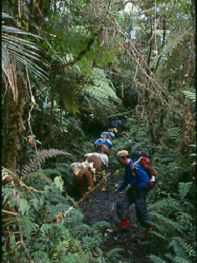 This is a tough walk in high, remote mountains and descending into dense rainforest; you will have to be self-sufficient and altitude can cause problems. Come prepared. ANYONE GOT ANY COMMENTS OR PHOTOS? WE'D BE DELIGHTED TO POST THEM! see below John Benson's piece on his expedition here, walked in support of the Multiple Sclerosis Trust. Arriving in La Paz by air is literally a breathtaking experience, at 4100m (13,450ft) this is the only airport I know with medical teams on permanent standby to look after breathless passengers. Ian Gardener, Jeremy Jez Trevis and I had come to Bolivia to walk from the Andes mountains to the Amazon rainforest, a journey that would take us from about 4700m to 950m (15,420ft 3,120ft). It was a great adventure. We had spent several months trying to get seriously fit for this trip (not wholly successfully in my case) and had included a five-day acclimatisation programme into our plans: two days lazing around La Paz, one day of mild exertion (my favourite type) and then what Ian had billed as a limbering up exercise which turned out to be a two day forced march with full packs on the high-altitude Lake Titicacas aptly named Isla del Sol. Despite these precautions I suffered from early symptoms of altitude sickness nausea, loss of appetite and splitting headaches but recovered after spending a morning at lower altitudes drinking several gallons of water. Our starting point for the main trek itself was the town of Pelechuco in the heart of the Cordillera Apolobamba mountain range. Getting there took two days by four-wheel drive on a deteriorating track that headed east from the shores of Lake Titicaca. We crossed the Ulla Ulla plain fording swollen rivers and scattering herds of wild Vicuna (a distant relative of the camel). From time to time we would pass through villages with square, whitewashed mud houses and catch glimpses of men in striped ponchos, women with their obligatory bowler hats set at jaunty angles and scruffy children tending herds of Alpaca. On the top of the 4900m (16,076ft) Katantica Pass we stopped at the point where topography forces the Andean streams to turn east and flow over 3,000 miles to the Atlantic rather than the hundred or so miles west into Lake Titicana. 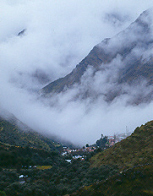 After the Pass the track plunges alarmingly through a mist-filled valley studded with steep glaciers a fitting approach because the small, colonial town of Pelechuco takes its name from the local Quechua word meaning cloudy corner. We set out from Pelechucco on the morning of the 23rd April led by Ronaldo, our local Quechua guide and Javier, our English-speaking guide. In addition to tents and the fashionable must-haves they sell you at Millets, we had to take all our food and so the team also included a dozen llamas (as pack animals), two llama handlers, Vidal and Seferino and Gary the cook. It was a beautiful day (which at this stage meant it wasnt raining) and almost immediately we set about a 1000m (3,280ft) climb to the first of many high mountain passes. The first day turned out to be one of the toughest of the whole trip as the reality of strenuous exercise at altitude hit us hard. The climb did at least bring us dramatic views and we spluttered and wheezed our way to the top through a landscape of jagged mountain peaks and cloud-filled valleys. As exhausted afternoon turned into dog-tired early evening the day almost ended in disaster when the llama team, which had taken a different route, failed to arrive at the prearranged meeting point. medical pack, a couple of start-a-fire-anywhere strikers (which didnt appear to have been tested in Bolivia), some basic rations and what was described on the label as a survival blanket. It had never occurred to me that we might actually have to use any of these things, let alone on the first day, and I certainly didnt relish the prospect of enduring a night of sub-zero temperatures wrapped in a sheet of tin foil, even if my dehydrated chicken and vegetable hot-pot had, as it claimed, been tested by NASA. The Gods relented however and finally, in the twilight, the two teams met. We threw up the tents by torchlight and then, exhausted, sat down with our guides for an animated discussion on some firm rules of engagement. It snowed during the night and we broke ice on our tents in the morning. Over the next three days we hiked across the Apolobamba Mountains rising at 6am and tackling two or three high passes (at up to 4700m), before making camp in the late afternoon. Between the passes we descended into remote, uninhabited glacial valleys which were fed by steep waterfalls and meandering rivers. Several times a day huge condors soared overhead and we envied their ability to traverse the bleak terrain with no apparent effort. For the majority of our trek we were following trails that had been created by Bolivias ancient pre-Inca civilisation - the Tiwanaku. The Tiwanaku Empire (1500BC-1200AD) grew to include parts of modern day Peru, Bolivia, Chile and Argentina and its capital city, Tiwanaku, with a population of more than 90,000, was probably the largest in the Americas. To administer and unite this 600,000sq km empire the Tiwanaku built a network of paved trails across some of the continents most inhospitable and inaccessible mountains and jungle. Many are still in use today and we were amazed at the precise, paved paths that guided our way up the passes, clung to the sides of valleys and navigated us through the jungle. Ronaldo told us that we were the first foreigners to follow this particular route and that even the local Quechua use it now only occasionally; we didnt see another soul for the first seven days of the trek. On the fourth day Ian was leading when he rounded a corner and saw fresh spots of blood on the path in front him. With a cry of Condor! we all turned to see a huge bird, with perhaps a 10ft wingspan, swoop down and then climb to join another immediately above us. Ahead a newly born calf stumbled down the hill with its insides trailing from a large wound. We had chanced upon a pair of condors in mid-kill. When the birds had retreated the rest of the herd massed around the solitary calf and tried to take their anger out on us, for the calf was mortally wounded. Seferino put the young animal out of its misery and shortly after we left the vultures returned to reclaim their prize. Ronaldo was concerned because local superstition says that it is bad luck to disturb a Condor off its live victim. We English cynics poo-pooed this and then had the smiles wiped smartly from our faces when, a couple of hours later, Jez went over on his ankle in the driving rain. We were making a steep descent at the time and as we carried on it soon became clear that he was in real pain. The implications of this injury could not be ignored. The days immediately ahead involved a 3000m (9,850ft) descent across rough, wet terrain into a very remote part of the country. If his ankle got worse it would be an extremely difficult and lengthy process to get him out as there is no helicopter med-evac service in Bolivia. Later that evening, after an agonising debate, we all decided reluctantly that Jez had to turn back. Jezs return to Pelechuco would be a considerable challenge in itself and so we agreed that Ronaldo, our head guide, should accompany him with Seferino taking Ronaldos role in the main group.Their journey would take three and a half days over high passes and we couldnt send a llama with them since these only worked as a team. So Jez and Renaldo took only what they could carry - and that didnt include a tent. They spent the nights in small stone shelters and existed largely on a diet of cheese and biscuits.It was an emotional farewell; Jez was gutted to have to turn back and we were going to miss him and his quirky sense of humour enormously. His departure left a big hole in the team. Much of the landscape that we walked through over the next three days could have applied for a role in a Tolkien movie. We had entered the Cloud Forest section of our journey where mists swirled around lichen-covered trees and green curtains of moss flanked the trail. From time to time the clouds would part to reveal mystical waterfalls and stunning views down into verdant valleys. Through this landscape the Tiwanaku had carved a path in the floor of the forest, which they then paved with slabs of stone brought down from the mountains and kept clear by diverting streams. Over time steams and flash floods have sunk the paths deeper into ground and the result is a series of tunnels with slippery stone floors, walls of thick moss (15ft high in some places) and roofs of plants and branches. Occasional shafts of light illuminated this magical world, highlighting spider webs, giant butterflies and a humming birds nest, which hid three white jelly-bean sized eggs and dangled precariously against the moss wall. Several times along the route we came across half eaten pineapples and chewed Bromilia plants, which had been discarded carelessly by the local Spectacled Bear. He would have heard us from miles away and had plenty of time to finish his breakfast before making an elegant exit (pursued by trekkers). hill taking the trail with them. Here we would carefully pick our way across the loose rock and mud trying not to be too put off by the carnage of torn trees and vegetation in the river far below. One morning two of the llamas fell 45ft when they lost their footing on a treacherous path. Each was carrying a twenty-kilo load, which added to the impact, and we were mighty relieved when they re-emerged, amazingly unscathed. On day seven we reached the small village of Moxos, the first settlement we had seen since leaving Pelechuco. Our arrival in civilisation came after a gruelling, ten hour day as we moved into dense rainforest the start of the Amazon basin through high heat, humidity, steep climbs and descents. If there was one section of this trip on which I earned your sponsorship, this was it. 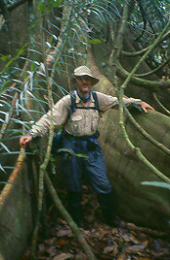 When I dressed that morning my clothes were still wet from the previous days sweaty endeavours, I was dirty, hot, sticky, irritable and every fly and bug in the Madidi National Park must have come and introduced themselves to me during those ten hours. I have never been so exhausted in my life. Moxos sits in a small beautiful mountain valley and it was wonderful to be able to enjoy a rest day, stretch out, relax and wash our clothes as well as ourselves. Around 20 families live in and around the village in simple one or two room houses; initially they greeted us with caution but for the children at least we soon became open-season and they demanded constant attention and entertainment. We had brought books and pens for the small school (more than we have ever received from the government the teacher told us), gave an impromptu geography lesson and challenged them to football and chess. There was also an important and, I think future historians will concur, significant cultural moment when my mini-disc player and I introduced Moxos to Elvis Presley. 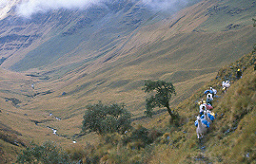 Whilst all this was going on Javier and Gary were restocking our provisions with chickens and fruit and recruiting porters for the route ahead as the llamas, which had been great companions and amazing bearers, would not be able to pass through the dense jungle that lay ahead. in some sections climbing steep slopes (45-50 degrees) with the help of roots, branches and bush ropes, in some sections on the river shores where grows a thick kind of bamboo, and where there was no other option, fording the Moxos river with fast water up to our waists. No matter how careful we were, we couldnt manage not to trip on roots, scratch our faces and hands with spiny bushes, hit our heads, slip and fall in steep sections, and the worst of all serve as food for thousands of mosquitoes and horse-flies. It seemed as though the jungle telegraph had alerted every self-respecting insect to our presence and we were plagued by flies, horse-flies, sand-flies, wasps, mossies and ants. But the jungle was stunning: majestic trees soaring 120ft into the canopy, psychedelic butterflies, vibrant birds and extraordinary plants like the Palma Andante tree which walks(!) supporting its trunk on long finger-like roots that it grows and discards as it steps through the forest in search of light. We saw the tracks of a Jaguar close to one of our campsites; it remained elusive but huge, prime-coloured macaws, screeching parrots, doves, humming birds, a big old owl and a host of other creatures kept us enthralled - and mollified us when we encountered yet more insects with attitude. At Tuichi village we swapped our porters for mules and began the last stage of the journey. We crossed the swollen Rio Tuichi clinging, one by one, to a tiny bamboo raft that was punted by a teenager called Victor. The current was swift but Victor is Master of the Tuichi and would be welcomed as a pilot of genius on the Cam or Cherwell. Even with Victors prowess it still took him an hour to ferry six of us and another for all the mules to swim safely across after one was swept downstream (it was found later safe and sound - if somewhat bedraggled). After the river we spent several hours climbing 1000m in blistering midday heat before lunching on delicious oranges that we picked from a grove in the village of Pata. Then, later that afternoon, we saw in the distance a giant brown gash across the rich green hillside. It looked like an ugly, festering scar on the face of a beautiful friend (with apologies to HRH). A bulldozer was forcing its through primary rain forest carving a road to Pata. The villagers are eager for its completion; it will enable them to export their oranges, will boost the local economy and increase their access to educational and medical facilities. However, after two weeks in pristine jungle, to us the devastation appeared to be gross vandalism. Sometime later, to our delight and amazement, we had a Livingston and Stanley moment when Jez suddenly materialised out of nowhere. His ankle had improved and on returning to La Paz he had driven for two days, with a new guide Juan Carlos, to the town of Apolo (our end point) and had then walked in to meet us. And so, reunited, we completed the journey together. It was festival day in one village we passed and we were welcomed in to watch the local Morris dancers perform a series of increasingly drunken jigs, before reaching Apolo on the 4th May. On reflection it seems fitting that this journey, which for us was such an extraordinary experience, should end on a surreal note: on arriving in Apolo we checked-in for the night at a Franciscan convent (I kid you not). The convent takes paying-guests to help fund their orphanage and so Javier, Gary, Jez, Ian and I ended the trek by drunkenly toasting our sponsors and adventures with wine made from fermented tangerines that had been brewed by nuns!